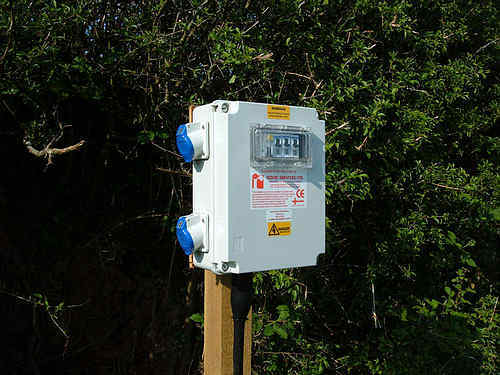 One of the most frequently asked questions is 'Can I use mains electricity in my tent?' Then 'What do I need to buy to do it!' It can be a little confusing to the new camper when faced with different options, and apparent differences in price for the equipment needed. A single/triple 13 amp socket(s), a distribution box with a transparent window housing a 10amp double pole MCB and 25amp RCD. This should be in an integral housing and physically protected to a minimum of IP44. This in turn is connected to cable with a BS EN 60309-2 plug (Commando Type) at the opposite end. These are sold complete at most reputable camping outlets. They are available with a single socket outlet as shown above or three socket outlets as shown below. You cannot sensibly expect to pay less than £50.00 for the single unit, more for the triple unit, so if anything is selling for less than this, treat it with caution. Integral RCD (Residual Current Device) and MCB (Miniature Circuit Breaker). Weatherproof Unit to a minimum of IP44. Purchase a unit which was designed for camping use and do not attempt to cut corners with other equipment that seems similar but which in fact may not be. It is not advisable to use normal household appliances, purchase appliances designed for camping use. Do not attempt to ‘make your own’ unless you are suitably qualified to do so and fully understand the technical implications. This article is meant as a general guide only. You must take professional advice when using or considering installing electricity in your tent, or caravan.